The first electronic tablet counter that grows as your company grows. 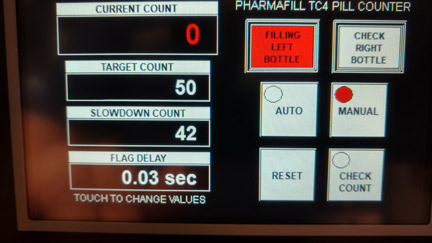 Our tabletop Pharmafill TC4 electronic pill counting machine automatically counts tablets, capsules, softgels, gelcaps, lozenges, pills and other solid oral dosage products and fills them into bottles or other containers. Just load the tablets into the disc feeder, set the bottles under the discharge chute and watch it fill the bottles fast at up to 2,000 pills/minute. It’s a very rare blend of simplicity, innovation, affordability and reliable, computer-controlled performance that only a family-owned company like Deitz seems willing to offer. Our latest TC4 uses the same, proprietary Deitz counting sensor technology as our fully automated TC3 tablet counter filler to achieve impressive counting accuracy of 99.99% or better. This level of high-tech, precision engineering has never been offered in a compact, tabletop tablet counter but we think small companies need access to the same level of technology as the pharmaceutical giants. Start with the basic, semi-automatic model. Smart vibratory feeder and hopper – automatically feeds the tablets from an oversized supply hopper through a variable speed, vibratory feeder chute to regulate the flow of tablets onto the rotating glass disc.